I was surprised how much I enjoyed Jason Aaron’s version of Conan the Barbarian. It has been a really enjoyable read so far. I was never a huge Conan fan, but the series was strong. Despite this, I did not anticipate collecting the new upcoming Savage Sword of Conan series. I might have liked this number one issue better than the Jason Aaron book. This issue was so great. I have been amazed that this current run of Conan has been so entertaining, especially since I have not been a huge fan of the Barbarian. I liked the art in this issue too, but it is in a different manner. The art was dark and full of shadows and it seemed to really fit the story being told. 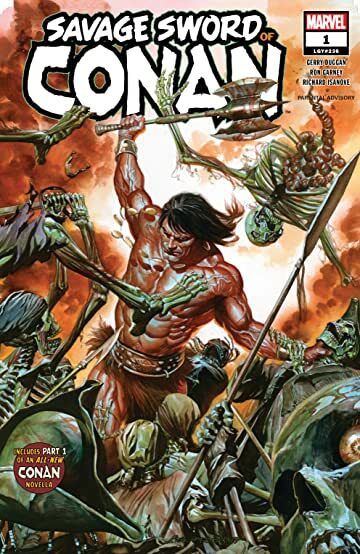 It looks like Savage Sword of Conan is going to be added to the comics to read. Marvel has done a top notch job so far and I am excited for it.